The summer crop maize, paddy and millet is harvested with its increment by 3.8% and 2.39% respectively except millet that is decreased by 0.11% due to decrease in area by 20 ha than last year attributing to have household food stock for 5-6 months in >50% of HH. 25-30 percent of HHs have made an income from sale of vegetable, mushroom, honey and sale of oragne (80 million rupees), sale of live stock and livestock produce ( 221 million rupees ), remittance and wage labour (10-20 thousand rupees/HH) that is considered as one of the main contributing factor in accessing food and way of livelihood all over the district. No significant cases of disease, disaster and climatic hazards felt during this reporting period effective enough to put an impact on livelihood and food security situation of the district. 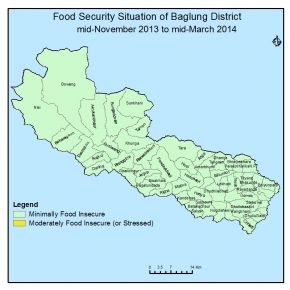 Overall food security situation of the district will likely to remain same as normal. Household food stock will be sufficient for > 4 months through stock of maize, millet and paddy as well as market purchase.Market stock will be sufficient and meet the public demand due to well functioning of local markets. There will be normal income from the sale of agric and livestock products. Remittance and pension will be continue. Situation of diseases, malnutrition and civil security will be same as normal.